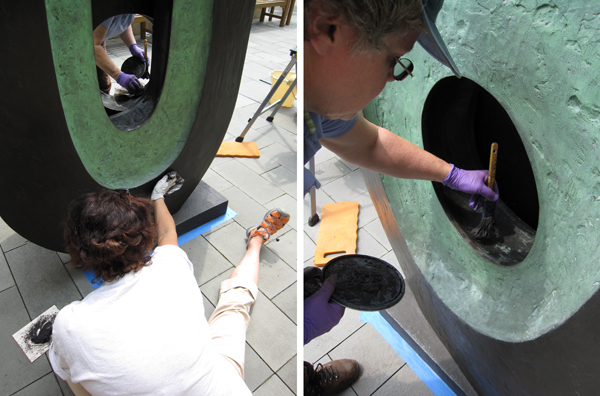 On Monday, conservator Lilli Steele and sculpture conservator Constance Stromberg washed and waxed our Barbara Hepworth sculpture, Dual Form, located in the Hunter Courtyard. After washing with water and mild detergent then rinsing and drying with soft cloths, we apply wax to the bronze as a protective coating (so we don’t remove it). It wears off with time especially where the bronze gets a lot of sun, rain, and wind abrasion. On the first day of this two day process, we wipe off just the upper layer of old wax to remove embedded particulate dirt before applying fresh wax. The following day, we buff the surface with soft cloths after the wax has a chance to harden. Conservation maintenance on outdoor bronzes should be done every 18 to 24 months to protect the surface, and in between there should be periodic washing two or three times per year to rinse off pollen and airborne particulates. It was interesting to learn that Constance has worked on four other Hepworth sculptures and considers her work to be among her favorites. 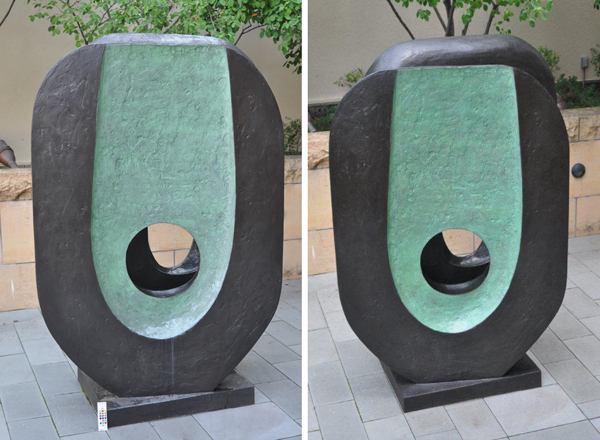 This entry was posted in Conservation Studio and tagged bronze, conservation, hepworth, outdoor sculpture, sculpture. Bookmark the permalink. Thank you for being such a fine art museum.